7.2 MRI: is there a role in obstetrics? Eur Radiol. 2018 Jan;28(1):363-371. doi: 10.1007/s00330-017-4965-y. Epub 2017 Jul 28. Kantarcioglu E1, Kahilogullari G2,3, Zaimoglu M1, Atmis EO4, Peker E5, Yigman Z6, Billur D6, Aydin S6, Erden IM5, Unlü A1. BMC Dev Biol. 2016 Jun 18;16(1):21. doi: 10.1186/s12861-016-0123-z. Langner I1, Stahnke T2, Stachs O2, Lindner T3, Kühn JP4, Kim S1, Wree A5, Langner S6. Front Neuroanat. 2015 Nov 25;9:150. doi: 10.3389/fnana.2015.00150. eCollection 2015. Wang R1, Dai G2, Takahashi E3. Magn Reson Med Sci. 2015;14(2):153-8. doi: 10.2463/mrms.2014-0034. Epub 2015 Feb 12. Otake Y1, Handa S, Kose K, Shiota K, Yamada S, Uwabe C.
1Institute of Applied Physics, University of Tsukuba. Abstract We acquired magnetic resonance (MR) microscopic images of chemically fixed human embryos of Carnegie stages 16 to 22 with a large image matrix (256 × 256 × 512) using an MR microscope that we developed with a 9.4-tesla vertical wide-bore superconducting magnet and a dual-channel receiver system to extend the dynamic range of the MR signal. The images showed clear anatomical structures at spatial resolutions of (40 µm)(3) to (60 µm)(3). We concluded that the experimental technique we developed will aid construction of the next anatomical database of the collection of chemically fixed human embryos. J Adv Res. 2014 Sep;5(5):507-23. doi: 10.1016/j.jare.2013.06.001. Epub 2013 Jun 11. Ultrasound Obstet Gynecol. 2013 Feb;41(2):190-7. doi: 10.1002/uog.11219. Epub 2013 Jan 3. Boyer AC1, Gonçalves LF, Lee W, Shetty A, Holman A, Yeo L, Romero R.
OBJECTIVE: To evaluate the reproducibility of regional apparent diffusion coefficient (ADC) measurements of the normal fetal brain in the second and third trimesters of pregnancy. METHODS: Fifty normal singleton fetuses from healthy pregnant women between 19 and 37 weeks' gestation were studied without sedation. Single-shot diffusion-weighted images of the fetal brain were obtained using a 1.5-Tesla magnetic resonance scanner and a six-channel body array coil. ADC maps were created using 0 and 1000 b-values along three orthogonal directions. Two examiners independently measured ADC values in the cerebellar hemispheres (CH), pons, thalamus, basal ganglia (BG), centrum semiovale (CSO), and frontal (FWM), parietal (PWM), temporal (TWM) and occipital (OWM) white matter. Correlation between ADC values and menstrual age was assessed by linear regression analysis. The bias and agreement of ADC measurements were determined using Bland-Altman plots. RESULTS: ADC values either remained constant (BG, FWM, PWM, TWM, OWM, CSO) or decreased (CH, pons, thalamus) with advancing menstrual age. Mean intraobserver bias for ADC measurements was not significantly different from zero. Small interobserver differences in mean ADC measurements (i.e. a small mean bias) were detected for CH (1.26 ± 0.20 vs 1.20 ± 0.18 μm(2) /ms, P = 0.006), PWM (1.37 ± 0.29 vs 1.33 ± 0.26 μm(2) /ms, P = 0.02) and CSO (1.36 ± 0.29 vs 1.33 ± 0.28 μm(2) /ms, P < 0.0001). Measurement agreement was acceptable. CONCLUSIONS: ADC measurements in normal unsedated fetuses in the second and third trimesters are reproducible except for small differences for PWM, CH and CSO between examiners. Copyright © 2013 ISUOG. Published by John Wiley & Sons, Ltd.
Am J Obstet Gynecol. 2012 Jun;206(6):505.e1-6. Epub 2012 Jan 13. Bamberg C, Rademacher G, Güttler F, Teichgräber U, Cremer M, Bührer C, Spies C, Hinkson L, Henrich W, Kalache KD, Dudenhausen JW. Source Department of Obstetrics, Charité University Hospital Berlin, Berlin, Germany. OBJECTIVE: Knowledge about the mechanism of labor is based on assumptions and radiographic studies performed decades ago. The goal of this study was to describe the relationship between the fetus and the pelvis as the fetus travels through the birth canal, using an open magnetic resonance imaging (MRI) scanner. STUDY DESIGN: The design of the study used a real-time MRI series during delivery of the fetal head. RESULTS: Delivery occurred by progressive head extension. However, extension was a very late movement that was observed when the occiput was in close contact with the inferior margin of the symphysis pubis, occurring simultaneously with gliding downward of the fetal head. CONCLUSION: This observational study shows, for the first time, that birth can be analyzed with real-time MRI. MRI technology allows assessment of maternal and fetal anatomy during labor and delivery. Copyright © 2012 Mosby, Inc. All rights reserved. MRI: is there a role in obstetrics? Clin Obstet Gynecol. 2012 Mar;55(1):352-66. Magnetic resonance imaging has a complementary role in obstetrical imaging to ultrasound (US). Although US has advantages as an initial imaging technique, there are significant numbers of patients who cannot be adequately evaluated for a variety of reasons including calvarial calcification, oligoanhydramnios, or simply obesity. MR can provide additional information that cannot be obtained by US and is invaluable in central nervous system anomaly evaluation, airway management, and planning for postnatal intervention. Newer techniques established in the postnatal population such as spectroscopy, diffusion-weighted imaging, and functional imaging have future applications in the fetus. Correia L, Ramos AB, Machado AI, Rosa D, Marques C. Source Maternidade Dr. Alfredo da Costa, Lisbon, Portugal. BACKGROUND: Performing magnetic resonance imaging (MRI) on women with gynecological devices is a completely accepted practice. The goal of our review is to assess how safe it is to perform MRI on women using contraceptive implants or devices. STUDY DESIGN: Literature review, searching in PubMed-Medline/Ovid for the following keywords: magnetic resonance imaging, intrauterine devices, Implanon® and Essure ®. RESULTS: Though plastic devices do not represent a contraindication to the use of the technique, those including metallic components have been submitted to several tests, after which they were classified as MR Conditional (devices presenting no risks in MR-specific environments) by the Food and Drug Administration. Thus, the use of MRI can be safely advised to women with this type of device as long as the magnetic resonance equipment is ≤3.0 T. CONCLUSIONS: Presently, there is no scientific evidence that contraindicates performing MRI on women with any kind of gynecological device. Therefore, this procedure is safe as long as it is performed under previously tested conditions. Copyright © 2011 Elsevier Inc. All rights reserved. Nemec SF, Brugger PC, Nemec U, Bettelheim D, Kasprian G, Amann G, Rimoin DL, Graham JM Jr, Prayer D. Source Department of Radiology, Division of Neuroradiology and Musculoskeletal Radiology, Medical University Vienna, Waehringer Guertel 18-20, A-1090 Vienna, Austria; Medical Genetics Institute, Cedars Sinai Medical Center, 8700 Beverly Boulevard, PACT Suite 400, Los Angeles, CA 90048, USA. OBJECTIVE: Situs anomalies refer to an abnormal organ arrangement, which may be associated with severe errors of development. Due regard being given to prenatal magnetic resonance imaging (MRI) as an adjunct to ultrasonography (US), this study sought to demonstrate the in utero visualization of situs anomalies on MRI, compared to US. MATERIALS AND METHODS: This retrospective study included 12 fetuses with situs anomalies depicted on fetal MRI using prenatal US as a comparison modality. With an MRI standard protocol, the whole fetus was assessed for anomalies, with regard to the position and morphology of the following structures: heart; venous drainage and aorta; stomach and intestines; liver and gallbladder; and the presence and number of spleens. RESULTS: Situs inversus totalis was found in 3/12 fetuses; situs inversus with levocardia in 1/12 fetuses; situs inversus abdominis in 2/12 fetuses; situs ambiguous with polysplenia in 3/12 fetuses, and with asplenia in 2/12 fetuses; and isolated dextrocardia in 1/12 fetuses. Congenital heart defects (CHDs), vascular anomalies, and intestinal malrotations were the most frequent associated malformations. In 5/12 cases, the US and MRI diagnoses were concordant. Compared to US, in 7/12 cases, additional MRI findings specified the situs anomaly, but CHDs were only partially visualized in six cases. 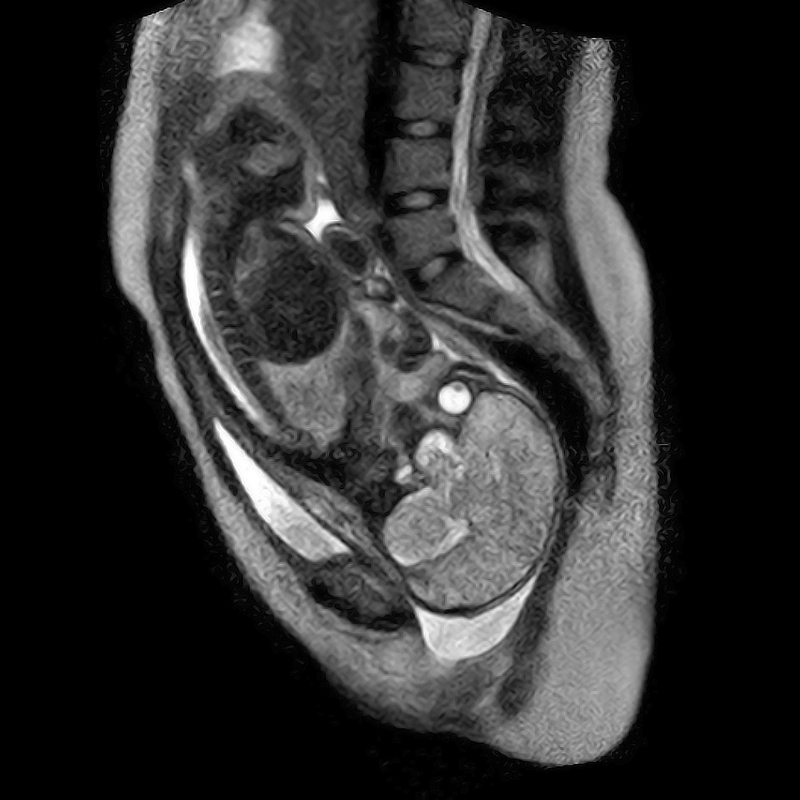 CONCLUSIONS: Our initial MRI results demonstrate the visualization of situs anomalies and associated malformations in utero, which may provide important information for perinatal management. Using a standard protocol, MRI may identify additional findings, compared to US, which confirm and specify the situs anomaly, but, with limited MRI visualization of fetal CHDs. Nemec SF, Kasprian G, Brugger PC, Bettelheim D, Amann G, Nemec U, Rotmensch S, Graham JM Jr, Rimoin DL, Lachman RS, Prayer D. Source Department of Radiology, Division of Neuroradiology and Musculoskeletal Radiology, Medical University Vienna, Waehringer Guertel 18-20, A-1090 Vienna, Austria; Medical Genetics Institute, Cedars Sinai Medical Center, 8700 Beverly Boulevard, PACT Suite 400, Los Angeles, California 90048, USA. stefan.nemec@meduniwien.ac.at, stefan.nemec@cshs.org. Abstract OBJECTIVE: In view of the increasing use of fetal magnetic resonance imaging (MRI) as an adjunct to prenatal ultrasonography (US), we sought to demonstrate the visualization of upper extremity abnormalities and associated defects on MRI, with regard to fetal outcomes and compared to US. METHODS: This retrospective study included 29 fetuses with upper extremity abnormalities that were positively depicted with fetal MRI and confirmed by postnatal assessment or autopsy. On a 1.5 Tesla unit, dedicated sequences were applied to image the extremities. CNS and extra-CNS anomalies were assessed to define extremity abnormalities as isolated or complex with associated defects. Fetal outcome was identified from medical records. The MRI and US findings were compared. RESULTS: Isolated upper extremity abnormalities were found in 3/29 (10.3%) fetuses. Complex abnormalities were demonstrated in 26/29 (89.7%) fetuses, including postural extremity disorders (21/26) and structural extremity abnormalities (15/26). Associated defects involved: face (15/26); musculoskeletal system (14/26); thorax and cardio/pulmonary system (12/26); lower extremities (12/26); brain and skull (10/26); and abdomen (8/26). Of 29 cases, 18 (62.1%) pregnancies were delivered and 11 (37.9%) were terminated. MRI and US were compared in 27/29 cases: the diagnosis was concordant in 14/27 (51.9%) cases, and additional MRI findings were made in 13/27 (48.1%) cases. CONCLUSIONS: Our results demonstrate that the visualization of upper extremity abnormalities on fetal MRI enables the differentiation between isolated and complex defects, which may be related to poor fetal prognosis. MRI mostly confirms the US diagnosis, but may provide additional findings in certain cases. Copyright © 2011 ISUOG. Published by John Wiley & Sons, Ltd.
Bamberg C, Scheuermann S, Slowinski T, Dückelmann A, Vogt M, Nguyen-Dobinsky T, Streitparth F, Teichgräber U, Henrich W, Dudenhausen J, Kalache K. Department of Obstetrics -Charité University Hospital - Campus Mitte, Berlin Germany. OBJECTIVES: We investigated the correlation between the angle of progression measured by transperineal ultrasound and fetal head station measured by open magnetic resonance imaging (MRI), the gold standard, in pregnant women at full term. METHODS: Thirty-one pregnant women at full term with a fetus in the occipitoanterior position were enrolled. First, the distance between the leading part of the skull and the interspinal plane was obtained with an open MRI system with the patients in supine position. Then, immediately after the MRI, the angle of progression was obtained by transperineal ultrasound without changing the women's posture. RESULTS: There was a significant correlation between the angle of progression determined by transperineal sonography and the distance between the presenting fetal part and the level of the maternal ischial spines (y = -0·51x + 60·8, r(2) = 0·38, p<0·001). CONCLUSIONS: The present study demonstrated a predictable relationship between the angle of progression obtained by transperineal ultrasound and the traditional scale to quantify fetal head descent. Based on our results, station 0 would correspond to a 120° angle of progression. However, this correlation is based on statistical assumption only and has to be proven in future studies. Copyright © 2011 ISUOG. Published by John Wiley & Sons, Ltd.
Phys Med Biol. 2010 Apr 21;55(8):2411-26. Epub 2010 Apr 1. Kikuchi S, Saito K, Takahashi M, Ito K.
Graduate School of Engineering, Chiba University, 1-33 Yayoi-cho, Inage-ku, Chiba 263-8522, Japan. kikuchi@graduate.chiba-u.jp Abstract This study computationally assessed the temperature elevations due to electromagnetic wave energy deposition during magnetic resonance imaging in non-pregnant and pregnant woman models. We used a thermal model with thermoregulatory response of the human body for our calculations. We also considered the effect of blood temperature variation on body core temperature. In a thermal equilibrium state, the temperature elevations in the intrinsic tissues of the woman and fetal tissues were 0.85 and 0.61 degrees C, respectively, at a whole-body averaged specific absorption rate of 2.0 W kg(-1), which is the restriction value of the International Electrotechnical Commission for the normal operating mode. As predicted, these values are below the temperature elevation of 1.5 degrees C that is expected to be teratogenic. However, these values exceeded the recommended temperature elevation limit of 0.5 degrees C by the International Commission on Non-Ionizing Radiation Protection. We also assessed the irradiation time required for a temperature elevation of 0.5 degrees C at the aforementioned specific absorption rate. As a result, the calculated irradiation time was 40 min. Phys Med Biol. 2010 Feb 21;55(4):913-30. Epub 2010 Jan 20. Hand JW, Li Y, Hajnal JV. Imaging Sciences Department, Imperial College London, London W12 0NN, UK. j.hand@imperial.ac.uk Abstract Numerical simulations of specific absorption rate (SAR) and temperature changes in a 26-week pregnant woman model within typical birdcage body coils as used in 1.5 T and 3 T MRI scanners are described. Spatial distributions of SAR and the resulting spatial and temporal changes in temperature are determined using a finite difference time domain method and a finite difference bio-heat transfer solver that accounts for discrete vessels. Heat transfer from foetus to placenta via the umbilical vein and arteries as well as that across the foetal skin/amniotic fluid/uterine wall boundaries is modelled. Results suggest that for procedures compliant with IEC normal mode conditions (maternal whole-body averaged SAR(MWB) < or = 2 W kg(-1) (continuous or time-averaged over 6 min)), whole foetal SAR, local foetal SAR(10 g) and average foetal temperature are within international safety limits. For continuous RF exposure at SAR(MWB) = 2 W kg(-1) over periods of 7.5 min or longer, a maximum local foetal temperature >38 degrees C may occur. However, assessment of the risk posed by such maximum temperatures predicted in a static model is difficult because of frequent foetal movement. Results also confirm that when SAR(MWB) = 2 W kg(-1), some local SAR(10g) values in the mother's trunk and extremities exceed recommended limits. Buls N, Covens P, Nieboer K, Van Schuerbeek P, Devacht P, Eloot L, de Mey J.
Dienst Radiologie and Dienst Fysische controle, UZ Brussel, Brussels, Belgium. Abstract The participation of pregnant women in radiology can be an emotional experience. The word "radiation" understandably invokes fear and uncertainty. Irradiation of a foetus should be avoided whenever possible. However, radiological examinations of pregnant women are often justified and unintended exposures do occur. Also pregnant radiology staff may remain working in the department. Lack of knowledge about the effects of both ionising (X-rays) and non-ionising (MRI) radiation is responsible for anxiety of patients and workers. If foetal exposures occur, they must be quantitatively evaluated and the risk put into perspective. This paper is intended to inform radiology managers, radiologists, technologists and referring clinicians in their management with pregnant patients and co-workers. The paper describes conceptus doses for both patient and worker that are associated with radiology practice, reviews the risks and effects of in utero irradiation, and discusses current national policies, international guidelines and practical aspects. Contacted Dr Cecilia Lo (cel36@pitt.edu) 16 August, 14 December 2010. Chien-fu Chang (chc160@pitt.edu) applications developer. Registered 14 December 2010 see email for login information. This page was last modified on 4 February 2019, at 13:35.